The nation and theories of nationalism still largely dominate the methodological toolkit and conceptual lexicon of many investigations from the fields of heritage and memory studies. 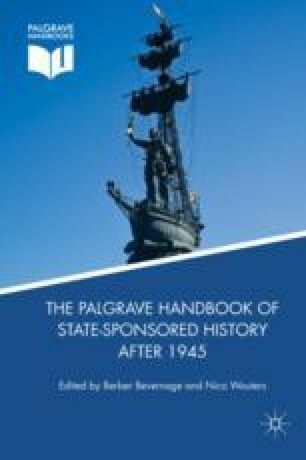 Although it is true that the past continues to be an important asset in constructing appropriate national identities legitimizing political structures and administrative frameworks, post-structural theories about governing and statecraft show that culture is not only the domain of the nation-state but serves a variety of agendas. Drawing on two case studies exploring the social, cultural, economic, and diplomatic entanglements of heritage politicization in the Russian Federation, this chapter encourages its readership to transcend their focus on the nexus heritage-nation-building and explore the imbrications between heritage and statecraft. By looking at how international players and private companies use the past in their efforts of crafting appropriate institutional landscapes and governable subjects adhering to convenient regimes of truth and power structures, this chapter encourages researchers from the field of heritage and memory studies to diversify their theoretical and methodological toolkit in investigations of the use of history in modern politics. The author would like to thank Berber Bevernage and Nico Wouters for their extensive feedback on this chapter. Different versions of this chapter were presented at various occasions and roundtable discussions; I would like to thank the participants for their productive commentary. First I would like to acknowledge Lynn Meskell and the members of the Stanford Heritage Ethics lab for commenting on a previous version. Financial support from Stanford University was also essential during the data collection phase of this project. Second, the staff of the Aleksanteri Institute (University of Helsinki) is also acknowledged for providing feedback on the first preliminary version of this chapter during my visiting scholarship at their prominent research institution. Gafiyatullina, I. (2016) ‘M. Шaймиeв: “Ecли бы нe былo зaпиcoк Ибн Фaдлaнa, мы бы нe дoкaзaли, чтo в 922 гoдy в Бoлгape был пpинят иcлaм”’, http://islam-today.ru/islam_v_rossii/tatarstan/m-sajmiev-esli-by-ne-bylo-zapisok-ibn-fadlana-my-by-ne-dokazali-cto-v-922-godu-v-bolgare-byl-prinat-islam/. TatCenter (2015) “Taтapcтaн плaниpyeт пocтaвлять ‘КAMAЗы’ и вepтoлeты Mи-8 и Mи-17 в Кypдcкий paйoн Иpaкa.” http://info.tatcenter.ru/news/146800/. UNESCO (2014) ‘The Director-General Receives Distinction for Teh Preservation of Muslim Cultural Heritage’, http://www.unesco.org/new/en/media-services/single-view/news/the_director_general_receives_distinction_for_the_preservation_of_muslim_cultural_heritage/#.VyFoBqODGko.